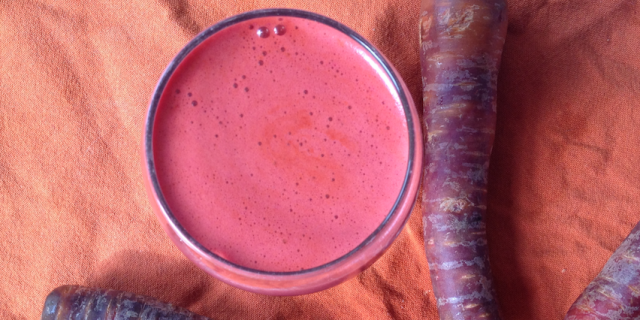 This Apple Beet Carrot Juice is a real classic combination. I used purple carrots in this one and added a bit of fresh ginger for some extra spice. Did you know carrots originally weren’t orange at all? They were originally purple or red. Orange carrots came about through both a process of natural mutation (from yellow carrots) and later domestication by most likely Dutch breeders. Purple carrots (usually orange inside and purple on the outside) have even more beta carotene than their orange carrots. They derive their purple pigment from anthocyanins, powerful antioxidants that can help prevent free radical damage. Other fruits and vegetables rich in anthocyanins are red beets, red cabbage, pomegranates and cranberries. Anthocyanins which have been found to protect against heart disease and even cancer. Learn more about the nutritional powers of carrots here on the website of the Carrot Musem. Learn more about anthocyanins and other recipes rich in anthocyanins here. Add all ingredients to a juicer, juice and enjoy your Apple Beet Carrot Juice!